For every autograph colletor a must in his or her collection. ORIGINAL HAND SIGNED signature this is the REAL DEAL This Item is out of the private collection Of the owner of Paul's Hollywood Cafe & Collectables. He has over 100,000 signed items and over 1000 costumes and props in his collection. Most items came direct from the celebrities or from major dealers. This item comes with a Certificate Of Authenticity. Measures 2 3/4" X 3 1/2" Cut from picture was signed on back. PLEASE don't wait to ask questions on last day I may not be around to answer them. 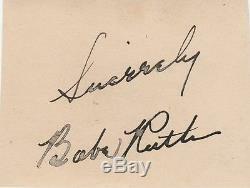 The item "BABE RUTH Hand Signed Autograph Signature WithCOA" is in sale since Tuesday, May 17, 2016. This item is in the category "Collectibles\Autographs\Sports". The seller is "paulvin" and is located in Sutton, Massachusetts. This item can be shipped worldwide.